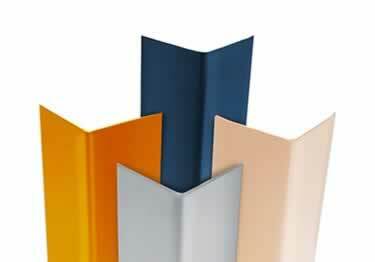 Heavy duty colored aluminum corner guards protect wall corners from dings and scratches. Used in hospitals, restaurants and airports, they are available in different sizes and colors. In addition to superior durability, they also add a level of visual attractiveness to any wall. Would these colored corners also work as inside corner trim? I need a 1" inside corner to finish off a garage floor. The trim would be used as base molding, attached to the vertical surface, so the floor can expand an contract under it. If you hace any better suggestions, I'm open. Heave duty colored aluminum corner guards protect wall corners from dings and scratches. Used in hospitals, restaurants and airports, they are available in different sizes and colors. Choose from a variety of Silver or Colored diamond plate switch covers. Fits all US and Canada receptacles.